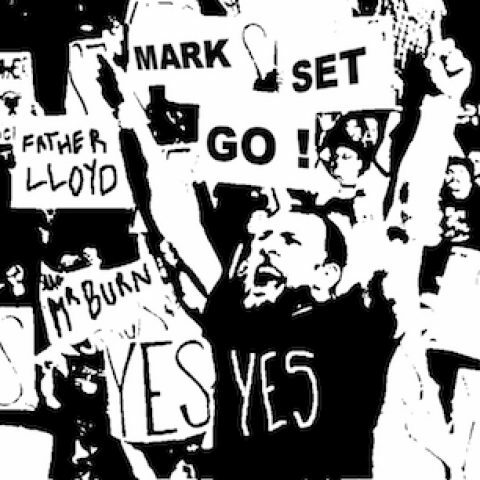 SummerSLAM DUNK – Welcome to the official home of the Mark Set Go Podcast! The main card opened up with the wail of guitars that is Ambrose’s entrance music. It got the Barclay’s Center pumped and ready for the show with a fresh Ambrose from injury standing in his friend’s corner. Rollins always seems to pull out some cool ring attire for big events and had a Thanos (of Avengers fame) gear with an infinity gauntlet inspired gold boot. Overall this match set the bar very high for every other match to come, as it was high paced and well executed throughout. Ambrose and McIntyre were smartly used sparingly and were not involved with the finish of the match, but it saw a busted-up Rollins defeat his nemesis and regain the Intercontinental title. The finish of this match really brought it down a peg for me. It is really hard for me to describe this match as the BB are very limited in what they can do and are very one dimensional. The New Day tried their best and brought out the best they could and were on the verge of taking back the titles when Rowan brought in his signature hammer and caused a DQ finish. BB retain. Not much to describe here. Strowman absolutely obliterated Owens and won a comical squash match. I feel terrible for KO here. He deserves more than this after everything that he has been put through over the last few months. The rare dud on this card. Sneakily one of the best matches on the card here in my book. Carmella moonwalked, and trash talked her way throughout this match in some tremendous heel work, even mimicking both her opponents signature taunts. She even turned the two friends against each other and had them wear each other down for a spell. Becky seemed to have in in the bag and was about to make the champ tap out when she ate a Natural Selection from flair and took the pin. Flair becomes a 7x champion, and lost a friend in the process, as a frustrated Lynch attacked her friend after the match. I am not ready to call it a heel turn just yet, as the crowd was firmly on her side, and we saw this story not too long ago with Sasha Banks and Bayley. Odd placement for this match on the card, but it potentially benefitted from such. These two have a history with each other and the crowd even started a “TNA! TNA!” chant. Joe cut a pre-match promo to Styles’ wife and youngest child who were sitting ringside, and it sent the champ in a fury. From the jump this felt personal and both men gave it their all and each other their best shots. The ending kind of takes away from the grade here, but it totally makes sense for the story, as Styles was down, Joe cut another promo towards the Styles family and it caused AJ to snap and beat down Joe with a chair to cause a DQ. This feud is far from over. Eight years in the making, that’s the story we have here. Daniel Bryan was able to let out his frustrations on his foe in the only way he can, strong style. Chops were turning Miz’s chest into hamburger meat, and it was fun to watch as both did their signature “Yes!” kicks and submission maneuvers. Late in the match Miz was knocked to the outside near the guardrail where his wife Maryse was sitting ringside. She slipped him some sort of weapon and he hit Bryan in the face with it when the ref wasn’t looking. Miz gets the upset win, and hopefully keeps this program going. The Demon King arose once again in Brooklyn. In a shocking surprise, we heard the heartbeat of the Demon and he showed up in his playground of Brooklyn (look it up, every year he is there). It was really cool to see Balor bust out the makeup and don the persona he is most famous for, I popped very hard for it. Not much to say about the match though. It was a certifiable squash match but was more entertaining than Strowman. It lasted longer, and it showed a very scared Corbin unaware of what he should do, along with tons of personality from Balor in all the face paint. Entertaining from start to finish, Balor goes over. Jeff Hardy was looking to take back his title after back to back shenanigans in his previous matches with Nakamura. Hardy even went as far as mimicking his mannerisms to throw him off his game, which was pretty funny. Hardy seemed to have the win in his grasp as he set up the champ for the Swanton Bomb. However, Nakamura rolled out of the way onto the ring apron. Hardy, the daredevil that he is, went for the leap anyway and crashed and burned when Nakamura evaded it. Nakamura then hit his Kinshasa and secured the victory. Randy Orton’s music began, and he walked towards the ring, but then turned around and walked straight back which was weird. Natalya was introduced before the match wearing her late father’s signature jacket. It was her first appearance since his untimely death, and was a pleasant surprise, as she was there to support her friend Rousey. This match was also a glorified squash, but the meaning of it was something special. It again lasted for a few minutes, and Bliss got no offense in. Rousey used this time to send a message and do some serious damage to her opponent before making her tap out to the arm bar. Rousey looked genuinely happy to have won and really soaked in the moment before rushing to the front row to embrace her husband and celebrate together. A year’s worth of storytelling was finally concluded on this night, as we saw Lesnar defend his title once again against Reigns. Before the match could get underway though, Mr. Monster in the Bank Braun Strowman entered the ring and let both men know that he will be waiting after their match to cash in his contract on whomever was victorious. Knowing this, Reigns began the match fast and furious. Giving Lesnar every ounce of offense he could. It seemed like it could be another surprise squash and giving him the Goldberg treatment. Lesnar however, came back and stepped out of the way of a Reigns suicide dive, which caused the big dog to collide with Strowman instead. Lesnar then focused his efforts to Strowman and gave him an F-5 as well as throwing his briefcase up the ramp for good measure. As he returned to the ring Reigns caught him with a spear and got the win to become the new champ. WWE was smart with how they booked this thing. Keeping Strowman lurking prevented the fans from hijacking the match and booing the entire thing. No cash in though, and that was fine. Overall I was pleased with the match and if this is indeed Brock Lesnar’s swan song, I commend him for appearing to put forth an effort like a professional and not half-assing it before he goes to the UFC. Reigns is the champ, for now, but it will be great to finally see the belt on RAW each week, as it frees up so many other superstars for other things. Great close to the show.